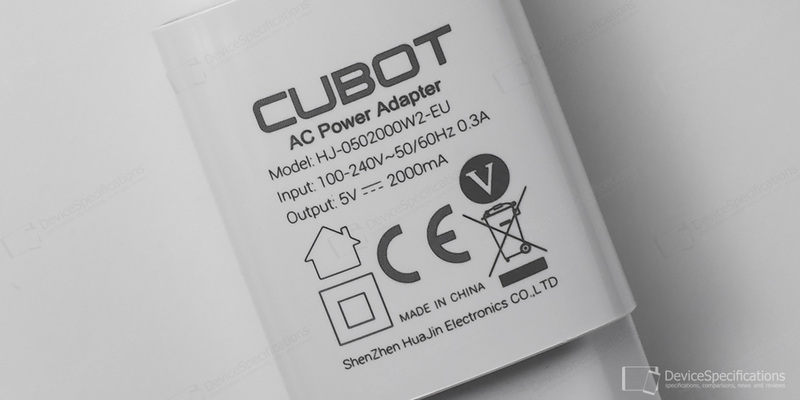 Cubot X19 is equipped with a 4000 mAh Li-Pol battery. It is non-removable and is coupled with a 5V/2A fast charger. All battery tests we run on the devices we review are developed by us and performed with the screen of the device being calibrated to 200 cd/m2. All battery saving features are disabled. It took 2 hours and 37 minutes to charge the 4000 mAh battery of our review unit from 0% to 100%. The battery charges with one and the same rate from 0% to 90%, after which charging slows down. It takes 1 hour and 52 minutes to reach 90% and the last 10% require 45 minutes to complete. The battery temperature starts at 25°C and gradually increases until it reaches 38°C - that's 58 minutes from the start. This level is maintained for 50 minutes and includes a 6-minute peak of 39°C in the middle. After that, the temperature starts decreasing and measures 29°C in the end. During our intensive browsing test, the battery of our review unit lasted for 10 hours and 30 minutes. The battery discharges slowly for the first half an hour but after that gains speed and maintains it until the end. The battery temperature starts at 33°C and in 1 hour and a half, it reaches 35°C remaining at this level until the end with minor fluctuations down to 34°C and up to 36°C. The video test for battery life uses a 1080p video at 30 fps with a ~20Mbps rate is used. Our review unit's score from this test is 12 hours and 22 minutes. Discharging is slow for the first 20 minutes but gains speed and maintains it until the end. 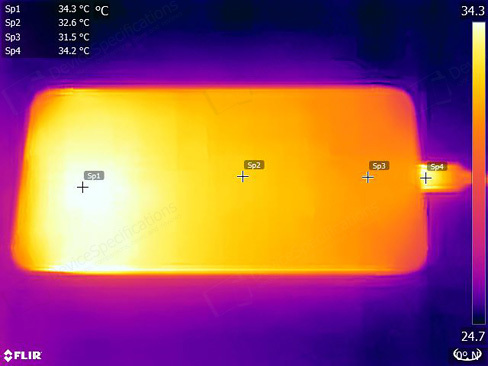 The battery temperature starts at 28°C and in 1 hour and 15 minutes reaches 33°C maintaining this level for 8 hours and 7 minutes, after which it goes up to 34°C and stays at this level until the end. For the 3D Graphics/Gaming test, the YEBIS OpenGL ES 3.0 3D Tech Demo is used. The battery of our review unit lasted for 6 hours and 36 minutes. Discharging is slow for the first 20 minutes but after that increases in speed and maintains it steady until the end. The battery temperature starts at 33°C and in 40 minutes reaches 41°C remaining at this level for three hours with regular jumps to 42°C. After that, it goes up permanently to 42°C and stays there until the end. The above photos of our Cubot X19 review unit are taken with a FLIR thermal camera. The left photo shows the device's temperature during charging. The hottest area is the left part of the upper half of the handset. The peak temperature there measures 34.3°C. The second hottest area is the charging port at the point of entering the device. The spot's temperature measures 34.2°C. 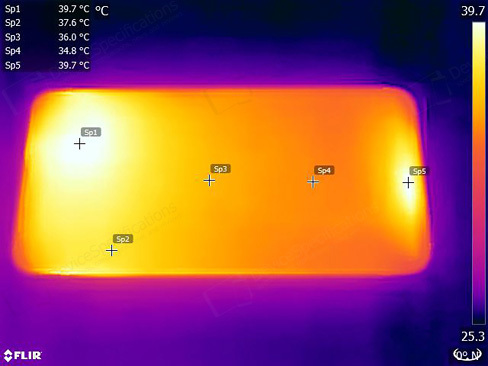 The second photo depicts the device's temperature during our 3D battery life test. In this case, the hottest area is the right part of the upper half with a temperature of 39.7°C. The second hottest area is the centre of the chin with exactly the same temperature of 39.7°C. The main screen of the Battery menu from the System Settings displays basic information about the current status of the battery - capacity, charging, usage data. 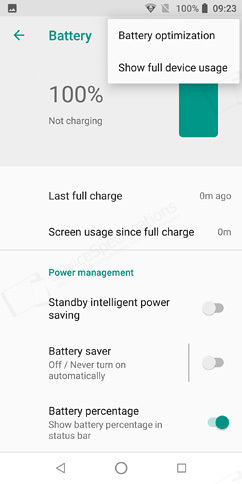 There are three toggles in addition to that - for the Standby intelligent power saving mode, the Battery saver, and Battery Percentage. 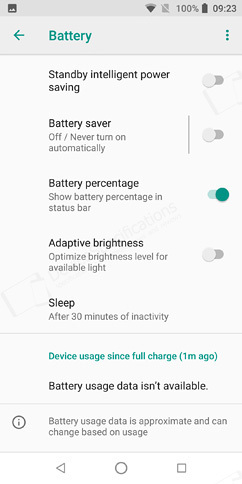 The Battery Optimization options are present as well.